Nothing fires up a crowd more than . . . fire itself! Now you can instantly add the drama of a leaping column of flames to your show or performance, safely and easily, with CHAUVET DJ’s new Firebird LED multi-color simulated fire effect. Featuring a built-in flicker effect that perfectly imitates a real flame, which is colorized by RGBA LEDs, the Firebird LED creates authentic-looking “fire” in a rainbow of hues -- with no heat. 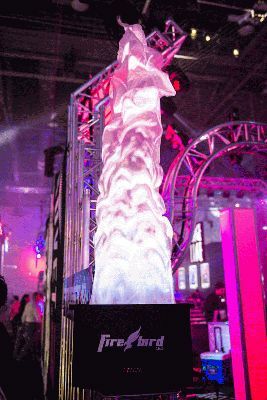 Majestic and mystical, the flare-like blaze rises 6.5 feet (2M) high, making it visible from long distances – and ideal for everything from stage shows and music concerts, to outdoor parties and special events. Rich flame colors can be created by blending the unit’s 4-in-1 Quad-Color red, green, blue and amber LEDs, using a wireless remote controller that comes included with the Firebird LED. Colors and other features can also be controlled manually from a display panel on the unit, or digitally via DMX using a 9-channel profile. An infinite spectrum of RGBA shades can be produced, allowing the Firebird LED’s towering flames to be color-coordinated to match any theme or décor, adding a personalized look to your performance or event. Bright and powerful, the Firebird LED utilizes four 5-watt 50,000-hour Quad-Color RGBA LEDs, which emit an illuminance of 1,109 lux at 2 meters. It features a variable strobe effect (0 to 12 Hz) and includes 3-pin DMX connectors and a wireless remote. Easy to transport, the Firebird LED unit weighs 22.2 pounds (10.1 kg) and measures 20.4 x 8.9 x 12.8 inches (518 x 228 x 325 mm). These dimensions make it a perfect fit for Chauvet’s CHS-50 VIP Gear Bag (sold separately), which offers ideal protection during travel and storage.